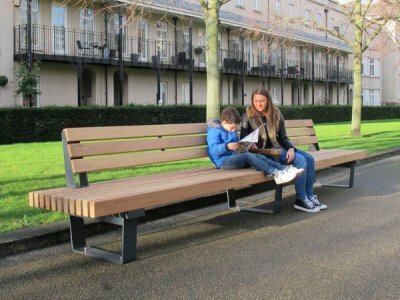 Following a successful launch of our popular RailRoad modular seating range in 2015, we made a further addition to the family introducing new Inline straight benches. This was followed by the Veeva range of seats and benches, characterised by the wedge-shape seat supports, heavy duty timbers and its array of standard configuration options. Like the RailRoad range, Veeva offers independent units and modules that can be joined side-by-side to form longer seating runs, both in straight lines and four standard curved sizes. With the ever-growing popularity of cycling, our town centres, workplaces and leisure facilities need to provide increased parking facilities for bikes. 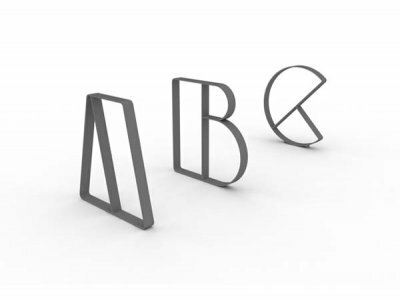 Furnitubes designed an alternative to traditional functional cycle parking - Letterform - which brings something very different to cycle parking provision. Each stand is in the shape of a letter which can be arranged to spell out the cycle parking function, the name of the site or company, or even a message. Our new collection of wall-top seating was launched with four different ranges - Alta, Contor, Lapa and Fortis - each with its own distinct character and designed to suit a range of budgets. 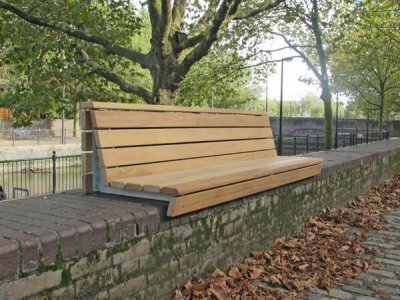 Where low level retaining walls are increasingly popular features in new landscape schemes, the addition of timber-topped seating platforms overcomes the problem of uncomfortable hard surfaces of masonry, and creates visually tidy and comfortable seating solutions. 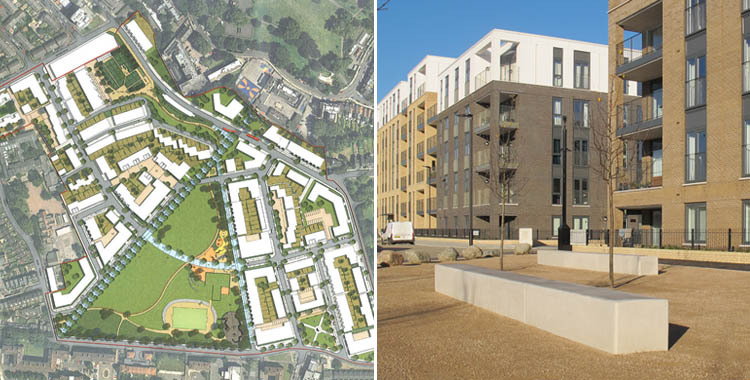 The £174M Myatts Field North regeneration scheme in Lambeth, comprises 808 new build homes, the modernisation and refurbishment of 172 existing homes and a new state-of-the-art community centre. The development also includes a new landscaped park with games area, new streets, green spaces and allotments. Furnitubes supplied concrete cubes and linear blocks from the Blyth range in a light grey colour with acid-etch finish, to provide functional seating for the new streets whilst also complementing the material palette used in the surrounding buildings and other hard landscape features. Located in the heart of Croydon, Green Dragon House was an anonymous and vacant 1960s office building prior to its redevelopment into 119 luxury award-winning one and two bedroom apartments. 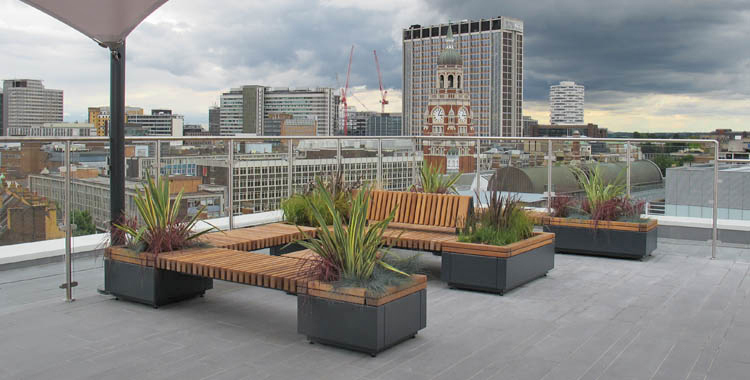 To provide significant outdoor space a roof garden was installed on the 10th floor, affording stunning views over Croydon and into central London and beyond. Furnitubes’ RailRoad design was the perfect choice for Green Dragon House, with its modular design allowing seating and planters to be linked to create large structures that can be left freestanding. The RailRoad products were complemented by the use of the Hollo range coffee tables, and a bespoke dining table with Hollo stools completed the suite of products supplied. In a bid to rejuvenate the Lockleaze neighbourhood, Bristol City Council have invested £2.5 million into the regeneration of Gainsborough Square, the open-space at the heart of the community. Following research by muf architecture amongst local people, one outcome of the findings led to the proposal for a permanent pavilion structure in Gainsborough Square, as a central feature to be used as a meeting point for local people and as a focus for community events. Muf utilised Furnitubes’ expertise in design and manufacture to develop a seating solution that integrated with and was fixed to the substructure of the pavilion. The products comprise a steel frame with recycled plastic boards for the seating surface, in 3 subtle colour shades as used for the pavilion deck and with outer ends of the seats sloping down to meet the pavilion deck. Heston Park - in Hounslow, West London - went through a regeneration phase including new and improved nature and children’s play areas, fitness facilities and re- shaped landscapes. This complemented the major investment at Heston Pools & Fitness centre located adjacent to the park. 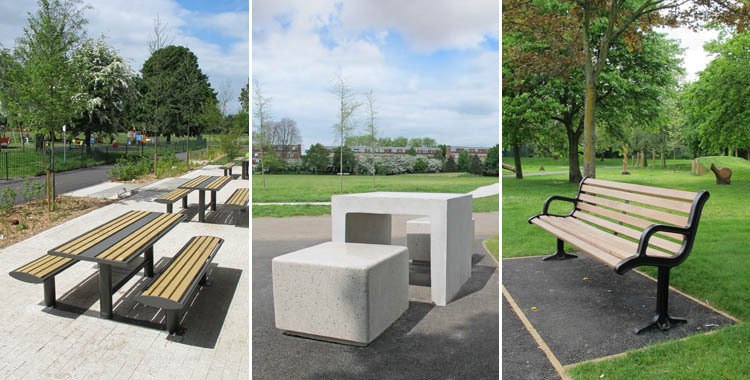 Furnitubes supplied a number of seating products to the scheme, each chosen to complement the different character areas within the park. Zenith picnic benches and tables were installed adjacent to the new swimming pool to offer external dining space for leisure centre visitors, with views out over the park. In the park itself, traditionally- styled New Forest seats and benches have been used, together with Core concrete tables and seating blocks in selected areas that also contained table tennis tables and play equipment.